I’m sorry to have to write you this letter. It’s Andrea. Your partner - or landlady - whichever designation makes you happy. Because, immune system, I do want you to be happy. Really, truly deep-in-the-gut happy. This is why for years, I’ve guzzled a green drink. Every. Single. Morning. It shouldn’t come as a surprise to you that - if given the choice - I would select chocolate covered coffee beans and Doritos for breakfast over liquefied spinach, celery and cucumber (let’s not forget the flax seed). Liquefied vegetables. That’s how much I care about you. And, nothing says I love you like yogurt. Real yogurt. You know, the homemade 24 hour stuff. You do realize that we’re talking about fermented milk, right? FERMENTED. I don’t think I need to bring up the vitamin pills. Or the sleep. Or the exercise. Or the kelp. Up to now, we’ve had a pretty good relationship. I gave you the best I had and you returned the favor by drop kicking and sucker punching the invaders that came my way. I mean, there was that time, during that once-in-a-lifetime trip to Paris. You remember, when you invited that foreign bronchial infection to squat firmly in my lungs? And who can forget the Christmas Eve strep throat incident of 2007 or the Norwalk episode of 2009? What a memory maker... the timing was awesome. Nursing a newborn, while puking my guts out. Oh, how we laughed over that silly prank. WHAT THE F#%* HAPPENED TO US? Forty-seven consecutive days of snot. Seriously? 47 days? You’ve outdone yourself this time, immune system old friend. Do I have the flu? Is it a cold? Pneumonia? The plague? Dengue fever? One thing’s for certain, whatever it is; it’s been hanging on like a lollipop sticks to hair. And I’m tired of it. Tired of the mysterious rashes, the puffy eyelids, the sandpaper in my throat and the coughing fits that result in me wetting myself repeatedly (not in a good way). And now my family is starting to suffer due to my unhealthy relationship with you. My kid, my mother, my husband, me – we all sound like Kathleen Turner after an all-night bender. In Mexico. It’s no use. I’m going to start seeing other immune systems. I need one with lymphocytes that don’t turn to dust at the first sign of a sneeze droplet. 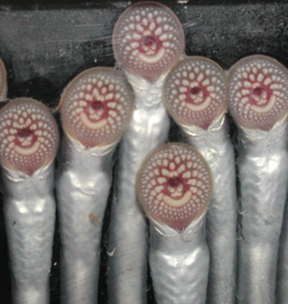 I'll be honest, I've had my eye on a lamprey eel. Those prehistoric stone-licking buggers never get sick. And they know how to tell a girl she looks pretty, even when phlegm is flying from her nose. So goodbye immune system, we had a good run. But as of now, it’s over. Gerry just told me that rats don't get sick for some reason....He now has the creeping crud and said maybe you could figure out what rats are doing right.